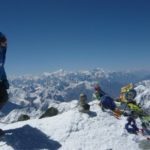 A 21-day expedition climbing Lenin peak, one of the easiest (and most accessible) climbs over 7000 m, together with Marija, IFMGA mountain guide. Even though it’s one of the easiest peaks over 7000 m, climbing Lenin peak is a great mountaineering challenge. Join me for an exciting 21-day expedition! At the border between Kyrgyzstan and Tajikistan, in the Pamir mountains, Lenin peak (7134 m) stands as the third highest peak of the former Soviet Union. The access to its base camp is quite easy from the Kyrgyz side. Because of that, the peak has become a very popular climbing destination. In fact, it’s suitable for experiencing high altitudes, and also as a training peak if you plan to climb an eight-thousander. The peak doesn’t have much technical difficulties. 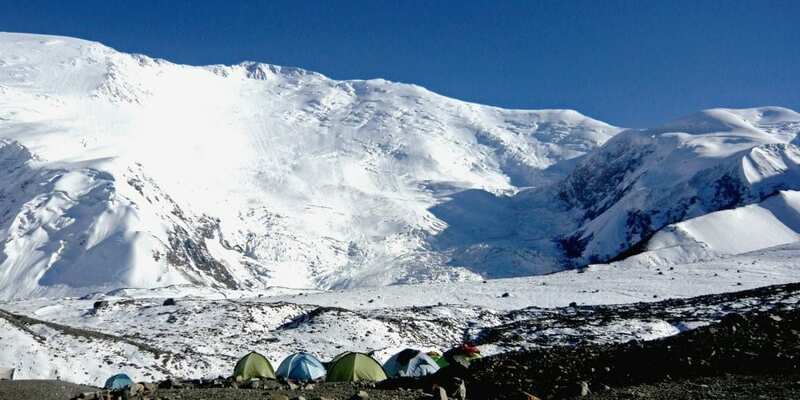 However, there may be avalanche risk between camps 1 and 2. Here, you can usually find landslides and glacial cracks. Besides, you will have to deal with changeable weather. Our expedition will start in Osh, the oldest city in Kyrgyzstan. From there, we’ll drive for almost one day to reach Achik-Tash Base Camp. After some acclimatization days, we’ll finally approach the summit. You can find the complete itinerary for this expedition below. 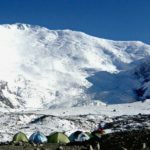 The expedition only takes place in July / August since these are the only months when the Base Camp is open. Please see ‘Looking to join a group?’ section below to find out which dates I run the expedition for this year. For next year, please contact me. Please contact me if you want to be a part of this expedition climbing Lenin peak. We can discuss the details together and then start planning this unforgettable adventure! A hard journey, almost 1 day-long drive to the base camp. Short acclimatization hike in the morning. In the afternoon, we’ll put our loads on horses and prepare equipment for the next day. Camp 1 is often known as an auxiliary base, offering high comfort already positioned tents and the dining room where we serve food. The trail follows a wide open valley and then crosses more slopes to the edge of the moraine, where the camp is located. The road to Camp 2 can’t avoid cracking, which has a fixed rope on the most difficult and exposed parts. The camp lies on a rocky edge, which is an integral part of the edge of the extensive glacial basin. This will be our last day of acclimatization before the decisive assault on the summit. The sole purpose of this day is to get an adequate acclimatization, which is best achieved by slow walking. Depending on the welfare of Camp 2 we descend only to Camp 1 or Base Camp. In both cases, we have one day of rest before we go to the top. Climbing to the top takes four days from Camp 1 and back. In these days we will strive to catch the optimal time to perform the most difficult and also the most desired slope. First of all, followed by the known rise in Camp 2 and Camp 3. Decisive day starts very early in the glow of headlamps. The mentally most painful part begins on a broken rocky terrain 400 meters after camp 4. In the parts where the path is quite exposed, it is secured by a fixed rope. Finally we stand at the highest point of Lenin peak (summit!). Then, there’s a long descent to camp 3 and we continue to the valley the next day. In Osh we’ll spend a whole day to visit a little town (picturesque market) and optionally buy some souvenirs in Kyrgyzstan. -Fixed tents placed in T2 and T3. -Organization and management of common devices (Monte Rosa). Each participant covers material costs acclimatization (food, transport, sleeping). -Rental of certain technical equipment. -Lunches and dinners in Osh. I was born in Kranj, Slovenia. 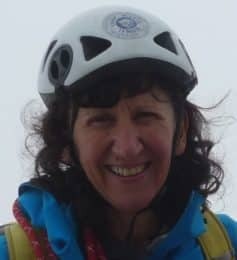 I am a biology teacher and I also have been a professional alpinist for more than 30 years. Until now, I’ve reached 4 eight-thousanders around the world: Broad Peak, Cho Oyu, Dhaulagiri and Mount Everest. In fact, I am the first (and still only) Slovenian female reaching ‘the roof of the world’. Together with my husband Andrej, we entered the Guinness Book of World Records as the first married couple to stand on Mt Everest. Beyond the Himalayas, I climbed in Alaska, South America and Japan, among other places. Sport climbing as well as competition and rock climbing have a very important place in my life and have taken me to many incredible and challenging places around the world. Marija is a very good and experienced guide. I will definately choose to go with Marija again. Everything was perfect and Marija extraordinary. I would repeat!